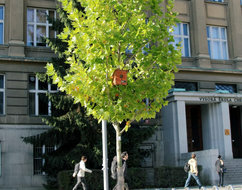 During autumn 2011 fake birdhouses were set up at various locations in Prague. They had speakers so that passers-by could hear excerpts from several audio-books.You could hear the idyllic atmosphere of the Prague literary scene in the Franciscan Garden where the author Lenka Reinerová recorded.Bára Hrzánová’s voice stopped both children and adults in their tracks as she recounted tales of missing socks in Stromovka Park.The main characters of the book Puntíkáři got up to pranks in the University Botanical Garden. A birdhouse with a loudspeaker was suspended high in a tree trunk and, through the voice of David Prachař, spoke to those near and far.